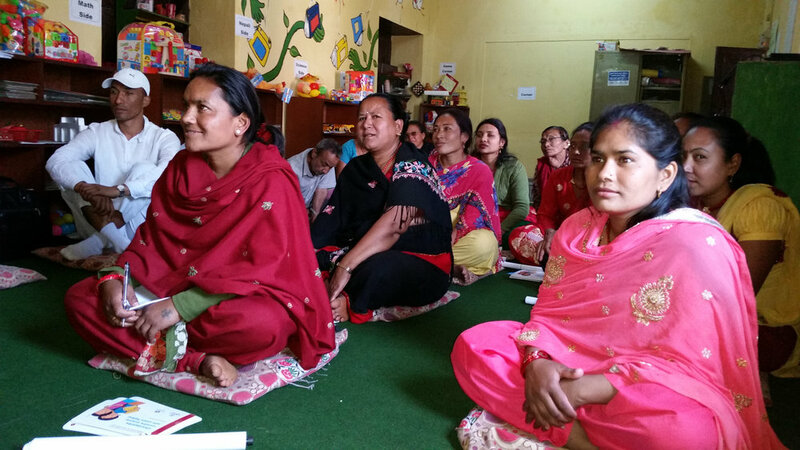 There are so many wonderful experiences from the USAID/Nepal Early Grade Reading Program that Another Option is working on. Applying the behavior theories and strategies we use in our health and energy being utilized in education and early grade reading to encourage parents (…and grandparents and older siblings) to read with their children is one exciting experience. Research shows that the most effective way to change behavior is through one-on-one experience or interpersonal communication. I saw it in action last week (April 24 ) when I attended a parent meeting in Bhaktapur, Nepal. The parents could not stop talking about their children….and especially their desire for them to learn how to read and to achieve beyond what they as parents have. The meeting was a parent (peer) education training session conducted by the program’s social mobilizers. Another Option developed the training guide the mobilizers are using to get parents to talk to other parents about the importance of Early Grade Reading and share tips on how they can go from desire for their children to read and excel to actually taking the necessary steps. The guide and other materials are available on our site. It is powerful for parents to know that they are not doing this alone and that other parents are also trying to fit in time to read with their children with work outside of the home. Parents (peers) who have experience with reading at home share ideas and tips with parents such as relieving the child from some household chores to study and read each night and listening while the child reads for 10 minutes each day.